Governor Godwin Obaseki of Edo state, on Sunday commended the Nigerian Army for its selfless efforts at ensuring peace and its successful curtailment of activities of Boko Haram in the country. Obaseki, speaking at the 2017 Army Forces Remembrance Day Celebration in Benin, said that the military should be accorded ‘First Line Charge’ for their selfless services. The governor, represented by the Deputy Governor of the state, Hon Philip Shaibu said that Nigerians should recognize the efforts of the Army and hounor them while they are alive. According to him, this day is to reflect on the corporate existence of the country and at the same time to remember that while we were sleeping, people were having sleepless night to protect the territorial integrity of this country and ensure peace. “I want to salute the military for the giant stride they achieved especially recovering the territory taken by Boko Haram and equally the successful taken over of the Sambisa forest. “The lesson for Nigeria is for us to remember that the only way we can have peace and get out of the economic recession is for us to contribute to nation building and put the country first.” he said. Also speaking, The Edo Commandant of NSCDC, Mr. Benito Eze and the Edo Comptroller of the Nigerian Immigration Service, Mr. David Adi, said that the Remembrance Day was worth celebrating. The duo said that the day was to remember the efforts of past heroes which would serve as motivation to serving and retired officers to know that their efforts would be remembered. According to the Speaker of the Edo House of Assembly, Dr. Justice Okonoboh, this day is worthwhile and I think it is good we remember and honour those who sacrificed their lives for us. “To impact on their lives is to take care of those they left behind; we need to reach out to them and better their lives. “There is a Legislation that focuses on taking care of fallen heroes and those who sacrificed their lives for the country,” he said. Also speaking, the Assistant Commandant General of the Nigeria Legion, Edo command, Mr. Johnbull Awanbor, called on the government to engage them in meaningful service delivery. Awanbor said that the ex-service men were willing to partner with the government in achieving sustainable development in the state and country at large. 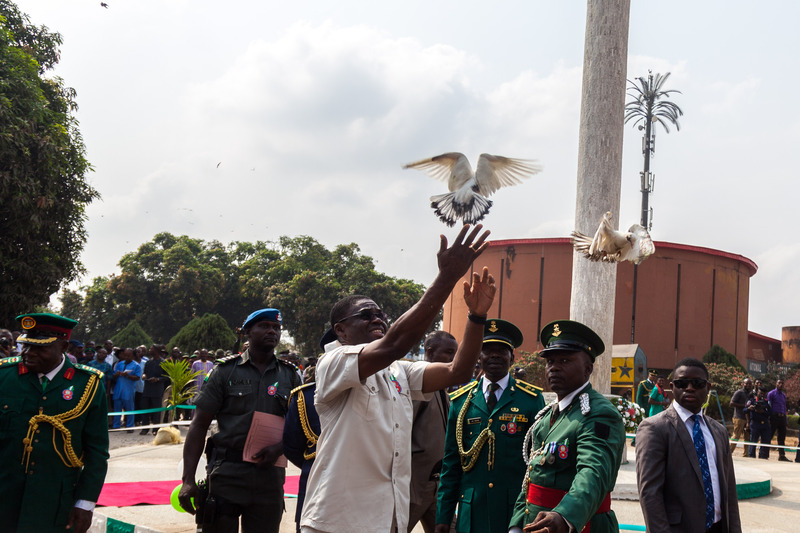 The highlight of the event was the laying of the Wreaths, symbolic release of the birds by the Deputy Governor on behalf of the governor and the inspection of a guard of honour. It would be recalled that the launching of the Emblem was performed by Governor Obaseki earlier in the month.